“It don’t matter if you are black or white…” sang Michael Jackson in his eponymous song Black or White. India’s chant is diametrically opposite “It matters if its Black or White!”, and no it’s not a racist statement, it’s all about the money that many have realized has ceased to be legal tender since India’s 9/11 (9th of November). At the stroke of midnight, 8th November 2016, the Prime Minister demonetised all Rs.500 and Rs.1000 currency notes, rendering them worthless paper. 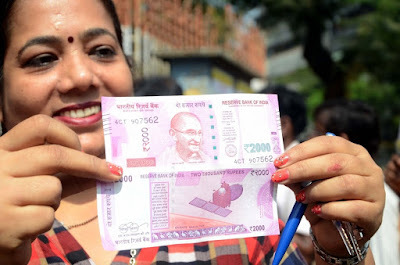 However to not irk the common man they have been provided with time to convert their currencies into Rs.100s or maybe the new Rs.500s or Rs.2000s. Master stroke, that’s what it is! The idea behind all of this is to curb the black economy that has taken gargantuan proportions in India. A parallel black economy was the reason behind very few people filing tax returns in India. With a population of 121 odd crores, only about 3.9 crores file their IT returns. (Economic Times, dated 10.11.2016) Those are the ones the Government is targeting & those are the ones who will be adversely affected. Money being deposited in different bank accounts will be monitored, and any large sum deposited would come under Income Tax net. There is no immunity scheme in place. There may be a spurt in foreign currency purchases, gold purchases; and the respective rates have risen due to speculative effect. People may turn religious and deposit their black money, of no use to them since they can’t declare it, in Dan Patras. There may be mushrooming of middlemen across India who for a 10% – 30% commission may offer to convert high denomination notes to smaller ones. The temples if benevolent enough, can convert the offered black money into smaller denominations. Money for temples is tax free, and they can go ahead and get their newly received cash donations converted in banks. Micro Finance Institutions that deal largely in currencies while lending to or retrieving loans from farmers. They may have to hold off their work for a few days. The biggest setback was 1500 points fall in Sensex on the 9th of November. By 10th it had gone up by around 250 odd points. Purchase of consumer goods & automobiles and fine dining will see a drop in the coming few days. Online shopping will see a decline, where Cash on Delivery is the most preferred mode of payment. But all of this will be short term, in the long run consumers and companies will get used to the new systems and mechanisms put in place by RBI. What happens to the demonetized 500s & 1000s? Well, if you have black money and cannot declare it or get it deposited in your bank account, you have to destroy them (don’t burn them, there’s enough pollution in the air already)! So what will RBI do with all the old notes? They have to handle the truckloads of demonetized currency notes rather delicately. All money will be shredded minutely such that they cannot be reconstructed. They will then be passed through a humidifier to be converted into briquettes, which are then given to contractors who mostly use them for land filling. They may even use some briquettes for sale as souvenirs, or for artistic or commercial purposes, as is done by Federal Reserve in United States of America. That’s the story of how Black has become White in India, and we will along with westerners be celebrating “Thanksgiving to our Govt”.